ARTWORK STYLE ONE SHEET. Approx. 21.5 by 29 inches HARD TO FIND! From the Toho movie Auqa Mothra 2. In near mint condition. Approximately 11 ½ by 8 inches. This colorful mini poster would look great on any wall! Godzilla fans who love to play games will really love this mini poster! SPECIAL GMK MINI POSTER. This amazing mini poster is a very special GMK treat! An outstanding colorful photo of all four of the GMK monsters in action, mounted on very thick poster paper (too thick to roll). Its dimensions, (14 X 10 inches) makes it much bigger than the regular ‘mini poster." 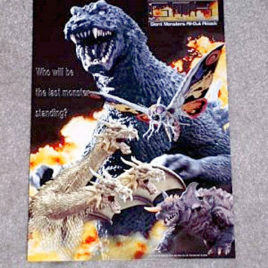 Again, on the poster it asks… “Who will be the last monster standing?” This is a great Mini Poster! Here is an UNUSUAL Godzilla item. Remember when mood rings were popular? Here is a Godzilla Mood Tester! 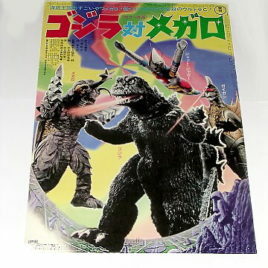 This mini poster has artwork of the 1962 style Godzilla blasting out his atomic breath. His breath actually has a mood test patch which changes color when you place your finger on the strip. This interesting item is a vintage piece but we are not quite sure of the age. 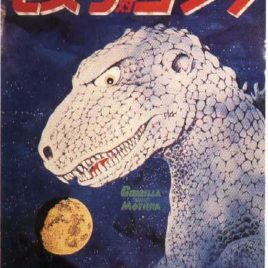 The back of the mini poster has a black and white drawing of the 1962 Godzilla with information (in Japanese) about his size, wieght and body weapons. It could be used as a coloring sheet. This cardboard mini poster was as far as we can tell a theater ticket premium. 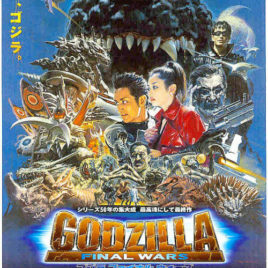 This is the AMAZING new mini poster for GODZILLA FINAL WARS designed by Nobuyuki Orai! The mini poster is approximately 8 by 10 inches. Great artwork of all the characters from the new movie! LIMITED SUPPLY AVAILABLE. This amazing mini poster is a very special GMK treat! An outstanding colorful photo of all four of the GMK monsters in action, mounted on very thick poster paper (too thick to roll). Its dimensions, (14 X 10 inches) makes it much bigger than the regular ‘mini poster." 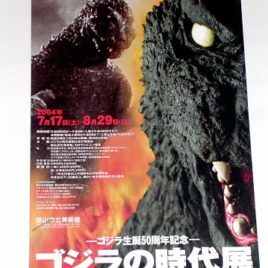 Again, on the poster it asks… “Who will be the last monster standing?” This is one great Mini Poster. Make sure to ask for the “SPECIAL” mini poster when ordering. 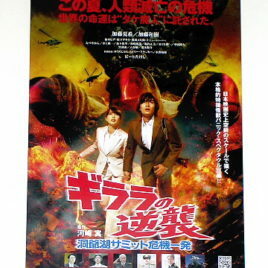 As they did for 2002 & 2003, Toho Films released the Godzilla movie "Tokyo SOS" as a double feature with a Hamutaro movie. 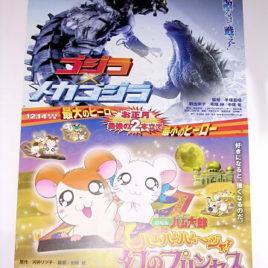 The only way we could obtain the Godzilla poster was to also get the Hamutaro poster. Each of two original theatrical release posters measures approximately 20 ½ by 28 ½ inches. From the movie Tokyo SOS. Great "head shots" of Godzilla, MechaGodzilla & Mothra as well as the Tokyo Tower. Approximately 8 by 10 inches. 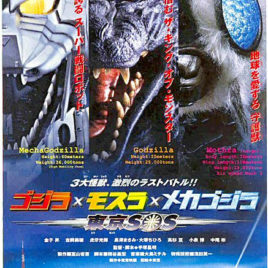 GODZILLA VS. MECHAGODZILLA 2003 ADVANCED STYLE TWO SHEET. 1/2 IMAGE OF GODZILLA, 1/2 IMAGE OF HAMUTARO. Approx. 28 3/4 by 40 1/2 inches. This is one of the most impressive Godzilla mini posters! Beautiful artwork by Orai. Approximately 8 by 10 inches. ORIGINAL RELEASE ONE SHEET Approx. 20 1/2 by 28 1/2 inches EXCELLENT CONDITION (MINT EXCEPT SMALL CHUNK OF LEFT BOTTOM CORNER MISSING.. YOU CAN STILL READ THE DATE). 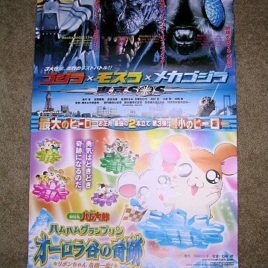 This mini poster (know as Chirashi in Japan) contains great photos of MechaGodzilla, Godzilla and Mothra and gives heights and weights for each as well as photos of Tokyo Tower, the Diet Building, and Rainbow Bridge, which are featured in the new film. This mini poster is really “two mini posters in one” in that it has the colorful mini poster for Hamutaro on the back. The mini poster is approx. 8 X 10 inches. (limited stock available). 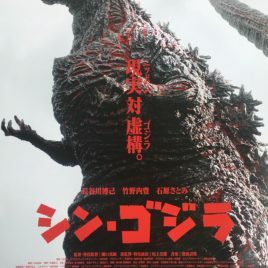 This beautiful poster is the Japanese one sheet (20 ½ inches X 28 ½ inches) advance theatrical version for the latest Godzilla movie that is to be released on Dec. 13th in theaters across Japan. 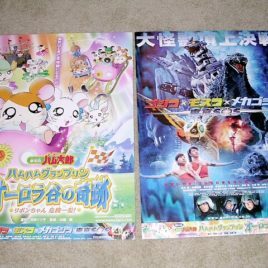 The poster promotes the double bill between the new movie Godzilla vs Mothra vs MechaGodzilla and the animated movie “Hamutaro” This is a great addition for any poster collection! (limited stock available). THIS IS A VERY HARD TO FIND PHOTO STYLE THEATER PROMOTIONAL 1/2 SHEET. Approx. 10 by 14 inches NEAR MINT CONDITION. This would look awesome hanging on some young fans wall. Guilala STOMPS the G-8 SUMMIT!!! Clawmark Toys gives top kudos to the massive claws on the foot of the X from Outer Space-Guilala Returns! That loveable Monster X from 1967 has been brought back in Guilala Stikes Back/G8 Summit Attack! The 2008 movie by Shochiku Company the same Producers of the 1967 movie was written and directed by Minoru Kawaski. He is an independent director with a definite taste for comedy. 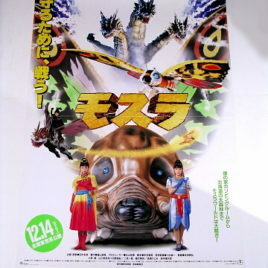 Here is the Chirashi or MINI POSTER depicting chaos on the ground and in the air as Guilala terrorizes Japan again! The dimensions of this mini poster are approximately 8 by 10 inches. (remember this is a Japanese poster which is metric system) There are photos on both sides of the chirashi. The mini posters are in new condition and will be rolled when mailed. Without giving out too much of the movie story, we can say that it brings a new twist to the Daikaiju Genre. Guilala attacks during the G-8 Summit and the world leaders respond with methods for combat that reflect their cultural beliefs. Kawasaki handles this with hilarious satire. A must have for ALL KAIJU MOVIE LOVERS! 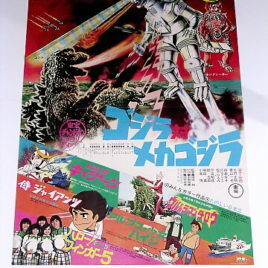 MECHAGODZILLA 1974 CHAMPION VERSION ONE SHEET Approx. 20 1/2 by 28 1/2 inches. HARD TO FIND. 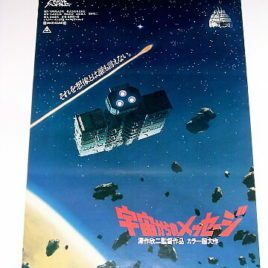 This is from the 80s when they showed a Toho Sci-Fi film with several other popular films. 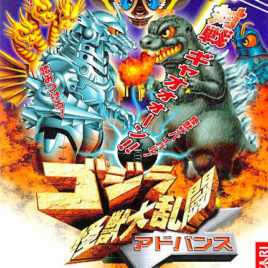 Great MechaGodzilla and King Seesar action! MINT! MESSAGE FROM SPACE 1978 ONE SHEET Approx. 20 1/2 by 28 1/2 inches. ALSO VERY HARD TO FIND. MINT CONDITION! 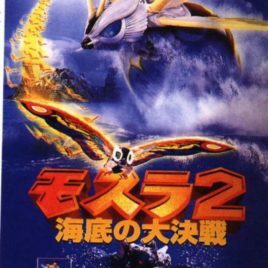 This is the 1996 Mothra II "Aqua Mothra" Original Theatrical l PHOTO STYLE ONE SHEET Poster. We purchased these beauties during our 6 years of living in Japan. 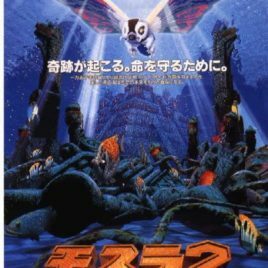 The really cool Aqua Mothra is featured. The poster is Approx. 20 1/2 by 28 1/2 inches. 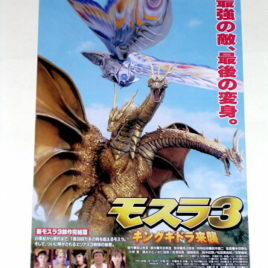 This is the action packed "Mothra 3" Mini Poster. 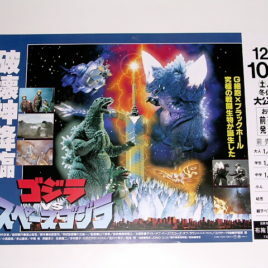 This colorful mini poster was released in 1998 to celebrate the movies opening in Japan. Measures approx. 7 by 10 inches on light paper stock. BEAUTIFUL!! PHOTO STYLE TWO SHEET. Approx. 28 3/4 by 40 1/2 inches HARD TO FIND! NEAR MINT (fold in the middle). Mothra vs Godzilla Artwork style by Matsumoto. One sheet Japanese approx. 20 1/2 by 28 1/2 inches. Excellent condition. 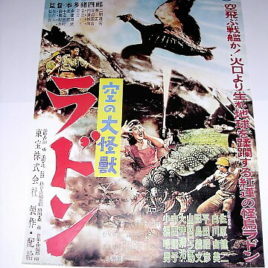 RODAN 1956 High Quality REPRINT ONE SHEET Approx. 20 1/2 by 28 1/2 inches. RELEASED IN JAPAN IN 2000 TO CELEBRATE THE VIDEO RELEASE BY TOHO (on thin stock like original) NEAR MINT. 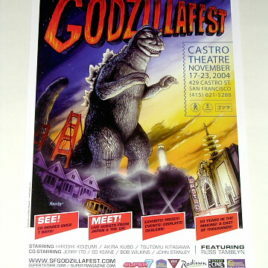 This is the limited GodzillaFest 2004 Poster with wonderful artwork by Mark Nagata. This is the poster that advertised North Americas biggest 50th Godzilla Birthday Party! This is a great poster and a part of Godzilla History! The poster measures 17 by 12 inches and is printed on thick poster-board. This wonderful Sega Godzilla 1954 Mini Poster celebrates the release of the Sega 1954 Godzilla Figures. 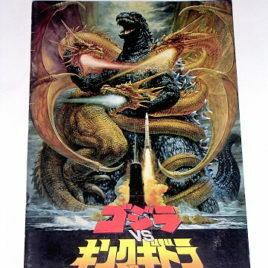 The poster features a great shot of Godzilla with his Atomic breath attacking the Diet Building in Tokyo. 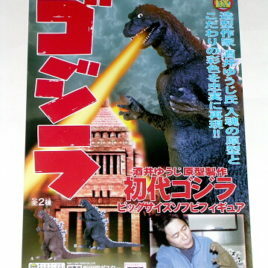 It also features a photo of the Legendary Japanese Kaiju Sculptor Yuji Sakai. The mini poster is on heavy cardboard stock and measures 7 by 10 inches. This is an original unused Japanese Theater poster for the latest Godzilla movie; Shin Godzilla. The movie opened in Japan on July 29th 2016. This is the large two sided poster with dimensions of 28 5/8 by 40 5/8 inches. It is a magnificent rendering of the very latest Godzilla. This is an original not a reproduction and comes in mint to near mint condition. 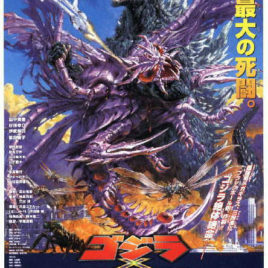 This is the "Special Since Godzilla # 2" Mini Poster. 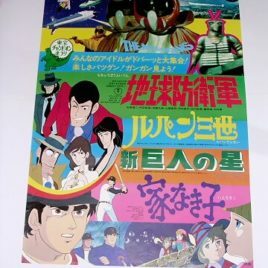 This colorful mini poster was released in 2004 to celebrate the shows opening in Japan. The Since Godzilla # 2 Display was held at the Koriyama City Museum of Art. 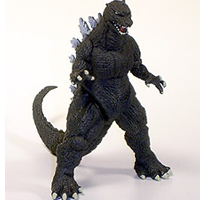 It featured Godzilla art, movie props, suits and scripts as they reflected Japanese Culture and Society over the years from 1954 to 2004. It was another 50th anniversary Celebration in Japan. Measures approx. 8 by 12 inches on light paper stock. Collectors don't miss out!